PHOTO BY JILL GOSCHE Lakota's Madison King tries to get the ball past Calvert's Hannah Burns (center) and Mallary Nielsen during the match in Tiffin Tuesday. 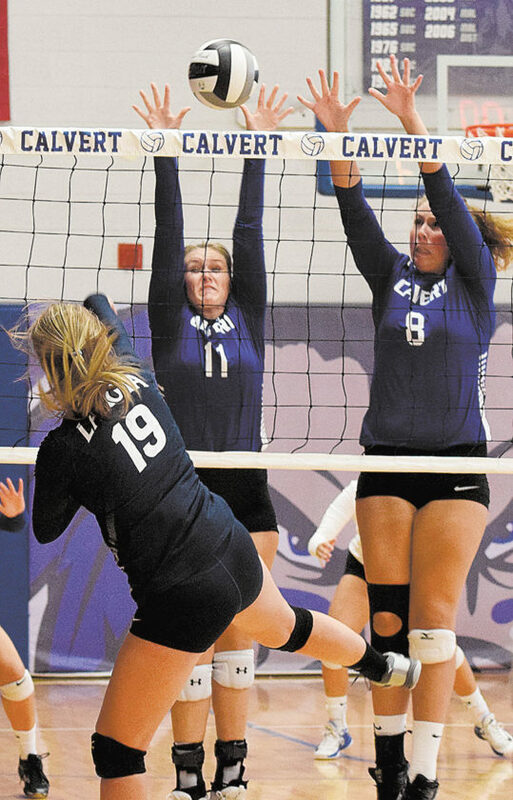 Calvert took advantage of Lakota miscues Tuesday en route to racing away with a 25-7, 25-17, 25-13 Sandusky Bay Conference River Division win. Lexie White and Kate Rombach each slammed six kills for the Senecas, with Emma White drilling five aces and White lining three more. The rest of Calvert’s points came from errors by the Raiders. White also tossed 17 assists and Sophie Burtis handed out 10. Sydney Johnson came up with eight digs, Shelby Hemminger had five digs and Zoe Meyer belted three solo blocks. NEW RIEGEL — They battled in each game, but Old Fort fared just a little better each time. 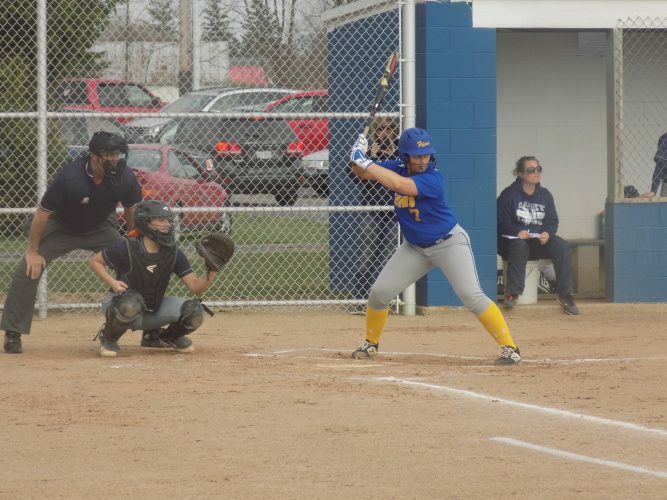 The Stockaders out-scrapped New Riegel 25-23, 25-21, 25-20 Tuesday in Sandusky Bay Conference River Division action, handing the Blue Jackets (6-1, 2-1) their first loss. Madison Guth (2 kills) keyed Old Fort with 29 assists and three aces while Jenna Clouse hammered 15 kills and Grace Wasserman smashed 11 kills. Morgan Miller and Ashlyn Magers (2 aces) each chipped in 17 digs, with Miller also slamming four kills. Savannah McCoy added 10 digs and six kills and MarcQue Harris (2 aces) had four digs. New Riegel got a double-double from two players. Aubrey Bouillon had 17 assists and 11 digs while Christen Hohman turned in 12 digs and 11 kills. Marianna Tiell backed them with 11 assists, Kaitlyn Kirian registered 10 kills and seven digs and Madalyn Reinhart had 10 digs. GENOA — Dakota Thomas topped 1,000 career assists and two teammates each registered a double-double Tuesday as unbeaten Fostoria dropped Northern Buckeye Conference foe Genoa 25-19, 25-16, 25-12. Thomas, who tied a school record last week with 50 assists in a match, tossed up 45 Tuesday on a 100-of-103 effort to give her 1,026 career assists. The senior sits third all time in Fostoria history, behind the 1,348 of Elaine DiCesare and 1,316 of Gabby Gregg. Thomas also served a pair of aces for the Redmen (8-0, 3-0 NBC). Meanwhile, Tyriana Settles smacked 25 kills and had 18 digs while Mary Harris slammed 11 kills and came up with 15 digs. Meredith Grine (2 aces) backed them with 10 digs, Baleigh Robinson chipped in seven digs, six aces and five kills, and Zoe Rice (2 aces) added six digs. BUCYRUS — Mohawk powered past Bucyrus 25-10, 25-10, 25-11 Tuesday in Northern 10 Athletic Conference play. Alexa Konkle (2 kills) tallied 29 assists, five aces and three digs for the Warriors (6-1, 3-1 N10) and Madi Chester registered 14 kills, five aces and four digs. Aubrey Margraf (2 aces) chipped in 11 digs, Kaylee Ward had seven aces, five digs and four kills, Paityn Clouse (2 digs) pounded seven kills and four aces, Emma Myers-Huffman slammed six kills and Ellie Shaw came up with four digs. NEW WASHINGTON — Buckeye Central turned back Northern 10 Athletic Conference rival Upper Sandusky 25-17, 25-19, 25-20 Tuesday. Alli Weithman sparked the Bucks (5-3, 4-0 N10) with 18 assists, five digs, three aces and three kills. Lexi Evak drilled eight kills, Lydia Ackerman had 15 digs, Allyson Sostakowski (2 aces) added six kills and three digs, Kendra Ackerman (2 aces) had six digs and three kills, Parker Phenicie registered seven digs and Alivia Niese (2 blocks) lined four kills. MILAN — Four Bellevue players turned in double-doubles Tuesday to propel the Redmen past Edison 25-16, 25-17, 19-25, 25-15. Molly Bullion (2 aces) handed out 45 assists and had 11 digs for Bellevue, Taylor Baxter added 15 kills, 10 digs and three blocks, Payton Vogel registered 14 kills, 17 digs, three aces and three blocks, and Madison Hrynciw turned in 10 kills and 18 digs. Morgan Dendinger accounted for 14 digs, Riley Mohr slammed seven kills and three blocks, Kami Hay had 10 digs and McKenna Davis tallied nine digs. CAREY — Carey tripped up Wynford 27-25, 25-20, 25-21 Tuesday in Northern 10 Athletic Conference action. Emma Wagner paced the win with 34 assists and McKenzie Row tallied 11 kills and eight digs for the Blue Devils (2-5, 2-3 N10). Alaina Tiell and Sadie Arend (2 aces, 2 blocks) both belted eight kills, Bailey Tanner lined four kills and Ellison Roark had eight digs.